The Lady Eagles hosted the Portland Bull Dogs Saturday, which turned out to be a beautiful fall day for soccer and the Eagles. Though the Bull Dogs put the effort in, the Eagles soared with a 6-0 win. Windham changed the game up a little bit by placing individuals in varied positions. Liz Mycock started in goal and gave an outstanding performance keeping the ball out of the net. Kate Kneeland wrapped up the game in goal and did not allow a ball to pass by. The defense again was strong with senior Laura McKenna, acting as a barrier the ball was unable to get by. These girls have worked together for several years and the playing skill they act out on the field shows that they are in continuous sync. The ball handling and drive up field is a sight to witness. If anyone has not had the opportunity to watch the Lady Eagles play, I highly encourage them to check out the post-season tournament play. Windham hosts its quarter final game on Tuesday at 6 p.m. at the stadium (opponent TBA). Windham High School junior Andrew Tanguay is a four sport athlete at 17 years of age. 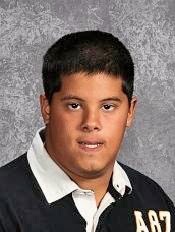 He plays soccer, basketball, baseball and does outdoor track, which is one of the reasons he is The Windham Eagle athlete of the week. “Andrew has been chosen for this honor because of his efforts with his sports, his positive attitude and he had a beautiful assist to a teammate last Thursday versus Portland,” said soccer coach Wally LeBlanc. Tanguay’s hobbies are playing outside, watching TV and playing video games. After a game he likes to watch TV and hang out with his family, he said. His mom is Carolina Tanguay, his dad is George Tanguay and he has a brother, Bryant Tanguay. His goal in the future is to go to college to become a landscaper. The most important thing on the field is: Trying my hardest. The Windham Eagles hosted the Scarborough Red Storms Saturday night in a much anticipated first game of the playoffs. The Red Storms opened the game taking a kickoff from Cameron McCartney and running 88 yards for a touchdown. The Eagles; however, answered right back with Tanner Bernier connecting with Hunter Coffin with back to back touchdowns for 12 yards and then again for 44 yards. The Red Storms didn't anticipate this storm brewing, but Windham brought their A-Game. The Eagles were just warming up to the Red Storms surprise and Bernier continued his passing success and connected with Logan Emerson for a 33-yard touchdown pass. Making this Tanner Bernier’s 20th down pass this year, in which 14 of them were made to Hunter Coffin. Cameron McCartney's kicks continued to fly down field, never giving the Red Storms a chance to run the ball again. After having a successful first half, the Windham boys came back ready to send Scarborough home with no chance of a possible continuation in the playoff games for them. Nick Curtis, Nate Watson and Logan Emerson continued to be successful in advancing the ball down field. Both Tanner Bernier and Nazari Henderson ran in 3 more touchdowns to make a bigger gap on the scoreboard. The defense was a key to Windham's success and the defensive line stepped up to the plate. Some stand out moments were made by Justin Labrecque, Logan Emerson and Dylan Varney that were contributing factors in the game’s outcome. Stopping the Red Storms from advancing the ball down field and having the ball turned back into Windham’s possession was outstanding by the defensive line. Hunter Coffin forced a fumble and was able to recover the ball himself marking a turning point for the Eagles. Windham wins with the final score of: Windham 42, Scarborough 20. Windham will host the Saco Junior Trojans this Sunday at 1 p.m. for round two of the playoffs. Please come and support the Windham Eagle Middle School football teams. 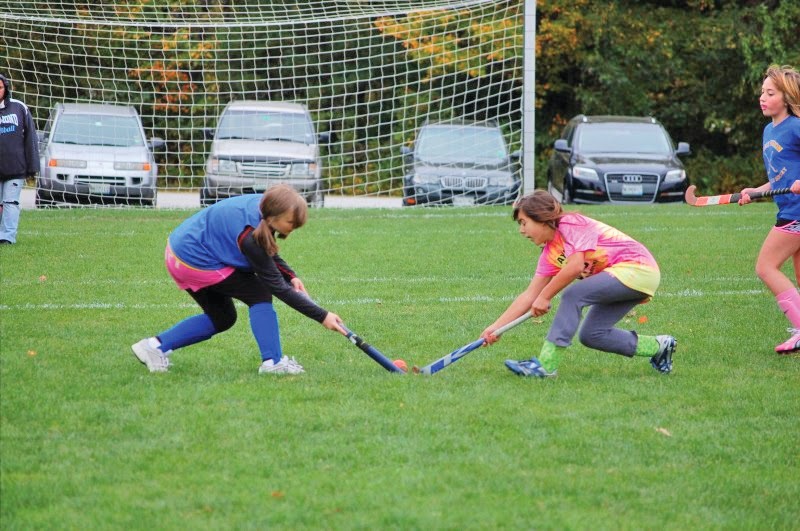 For the third straight year, a group of mothers in Raymond have spent their Sunday afternoons in September and October introducing girls in grades three, four, five and six to field hockey. “It’s about focusing on the fundamentals and giving the girls exposure to a variety of sports,” said Julie Wilson, who has organized the group for the past three seasons. Her daughters, Whitney, 11 and Ellie, 9, both play. Other Raymond moms involved in the program include Carrie Colby, Kristin Fielding, Gina Bolk and Erin Gurney. 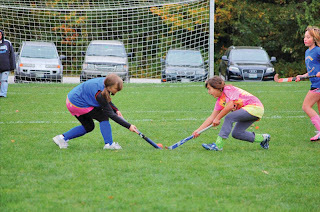 Windham High School field hockey captain Morgan Richmond, a Raymond resident, has also been instrumental in the program, helping teach the girls the fundamentals and some cool stick-handling tricks. The first time Richmond showed the girls a maneuver, their eyes lit up and they beamed big smiles as they envisioned themselves trying the move during a game. But Wilson stressed that making sure the girls learn the basics remains the foundation for the program. They learn where they need to be on the field when playing a certain position and the get a better understanding of what the rules are. When they move up to the next level, this knowledge will help them fit into a new team more quickly. The girls from Raymond have been playing Sunday afternoons against teams from Poland, Bonney Eagle, Lake Region and other area towns. They will participate in a total of three tournaments this fall and will wrap up their season in a round robin tournament at the University of Southern Maine on October 21. Wilson said that a goal of the program is to prepare the sixth-grade girls to hopefully continue their play for the Windham Middle School team next season. This year there are 10 sixth-grade players in the Raymond program and Wilson said that she’s been in touch with the Windham Middle School coach so that they are on the same page in preparing the girls for further play. Two graduates of the program, Kora Hunter and Chloe Smith, both from Raymond, played for the Windham Middle School team this year. 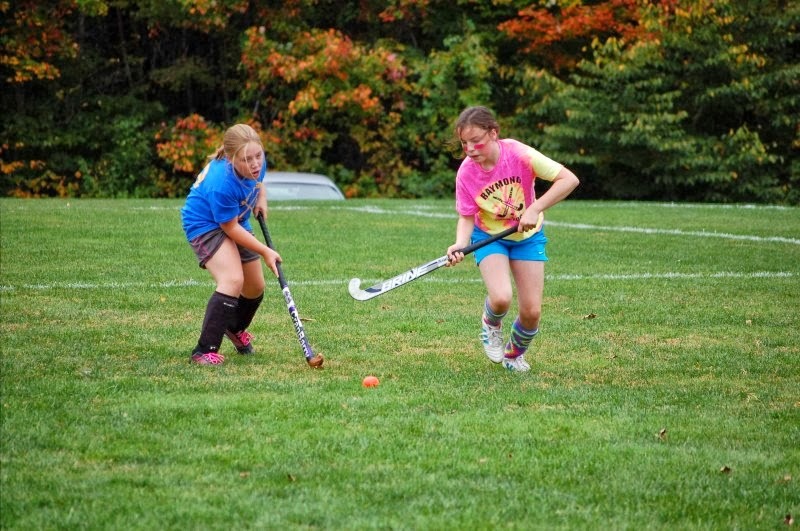 Additionally, beginning this year RSU 14 has begun providing transportation to Windham for seventh and eighth grade students to participate in the Windham Middle School sports programs that are not offered in Raymond, including field hockey. To ensure that the girls aren’t forced to make a choice between sports at such a young age, the Raymond program has always been and will continue to be played on Sundays so it does not interfere with Raymond Rec Soccer on Saturdays. It was a beautiful fall day as the Windham Eagles suited up to play their last regular game of the season. The Eagles came out flying and took a quick lead in the game with a score on their first possession. Tanner Bernier threw a 16-yard touchdown pass to Logan Emerson. Windham stepped up again and Tanner Bernier threw a 53-yard touchdown pass to Hunter Coffin who was grabbed by a Portland player and tipped the ball which bounced off the Portland players helmet, hitting Coffin’s foot and then Coffin was able to amazingly caught the ball ending up in the end zone stunning the referee, Portland coaches and announcer. Windham was just getting warmed up when Portland came back with a charge of their own, scoring three touchdowns in the matter of four minutes. The Bull Dogs continued to attempt onside kicks which ended up being successful. They then scored off a turnover which brought the Eagles defense down. This put Windham behind by three possessions. Being at the right place at the right time proved fruitful when Kiante Smith intercepted Portland’s pass and ran down field with the help of his teammates giving Windham possession of the ball. With this added adrenaline the Windham boys got some pep back into their step and had an onside kick of their own which was successful. Tanner Bernier made another great pass to to Hunter Coffin for 43 yards. Tanner Bernier threw another pass to Nate Watson for a 39-yard touchdown. Throughout the game Curtis, Watson, Henderson, Emerson and Coffin showed they could catch the ball. Grover, McInnis, Labrecque, Potter, Jacobson and the Kilgallons continued to try and send the Bull Dogs to the pound. Though Windham started off strong and ended strong, the Portland Bull Dogs were able to hold onto the ball and run the clock out. The final score was Portland 36- Windham 26. The Eagles are headed to the playoffs! This puts the Windham Eagles into fourth place in the standings. Windham will host Scarborough this Saturday night. JV will play at 4 p.m. and varsity directly after. Come out and support the Middle School JV/varsity football teams!